The Fyndraai Restaurant is situated on the Solms-Delta wine estate outside Franschhoek (Franschhoek is also known as the gourmet capital of South Africa). Fyndraai Restaurant on Solms Delta has a very unique and local twist on popular Franschhoek restaurants. 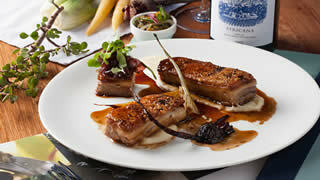 Fyndraai offers a modern take on traditional Cape Cuisine whilst showcasing the history of the area. The cuisine of Fyndraai, like its adventurous wine and atmospheric farmstead, lives up to the Solms-Delta claim of being proudly Hiervandaan (“from this place”). Dishes explore the diverse culinary heritage of the Cape, uniting European, Asian and African flavours in a fusion of tradition and creativity. The Fyndraai Restaurant of Franschhoek is part of a larger initiative on the estate called the Dik Delta Fynbos Culinary Gardens, part of a greater 15ha Fynbos and Renosterveld park currently under development. Fyndraai Restaurant is housed in what was once the old stables and workers’ accommodation on the Solms-Delta farm. There are two indoor dining areas at Fyndraai: a room that seats 30 and a striking glass structure which can seat up to 60 guests. Additional outdoor seating for at least 60 guests are available on the stoep and the lawn. The service at Solms-Delta has become synonymous with genuine upliftment. In keeping with this policy, all waitrons have been recruited from the resident farm worker families or from the Franschhoek area, many of whom have lived on Solms-Delta forever. Fyndraai Restaurant also offers delicious picnic menus.